Lifetime Goal: I don't have a clue anymore. I don't change my profile often. If you go to Otakon, you're likely to see me there. The Platypus, or the "What the ******** is that thing?!" ? 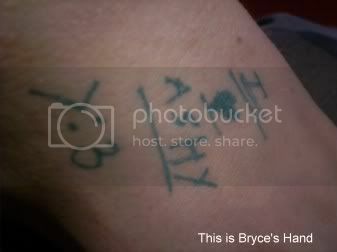 A sign from Bryce, the best friend I've ever had. Thanks dear. Sign from Aesthetically Delicate. Thank you muchly! (02/15/2010 05:10 pm) Ashy's Katsucon 2010 Adventure!! You are a sweet girl. You're the only one who commented or sent a PM to wish me a happy birthday. I hope you had a blast at Otakon. I believe part 2 is scheduled for the thirtieth, but I'm not getting my hopes up. I'm logging off now... You should check out the MLP forum sometime. I'm usually there if I'm online. Have you ever seen Ponies; The Anthology? ...Tell me that's a fanfic. I got sucked into it last fall. I should probably be ashamed, but one of my favorite anime is already called Princess Tutu, so it wasn't a huge leap for me. Of course you'd throw 'raver' into a pony costume. I'm surprised you're not blending Pinkie Pie with Repo. Haven't checked this page in a long, long time... Apparently you're a pony fan now too? ALSO sorry I haven't been in touch lately, my mom was really sick and it took 5 weeks for test and bloodwork results to see if she had liver cancer or not. She doesn't: heart: They did find 2 lesions on her liver and something in her throat that can turn to cancer. s**t keeps getting crazier.